Runes are letters in an ancient Germanic alphabet used from about 150 to 1100 CE, prior to the common usage of the Latin alphabet. The word ‘rune’ is thought to come from a Middle English word that means “secret writing”. Runes are also known as futhark/fuþark or futhorc/fuþorc based on the first six letters of the runic alphabet. The three best-known runic alphabets are the Elder Futhark (Norse, Germanic tribes, c. 150–800), the Anglo-Saxon Futhorc (c. 400–1100), and the Younger Futhark (Scandinavian modification c. 800–1100). 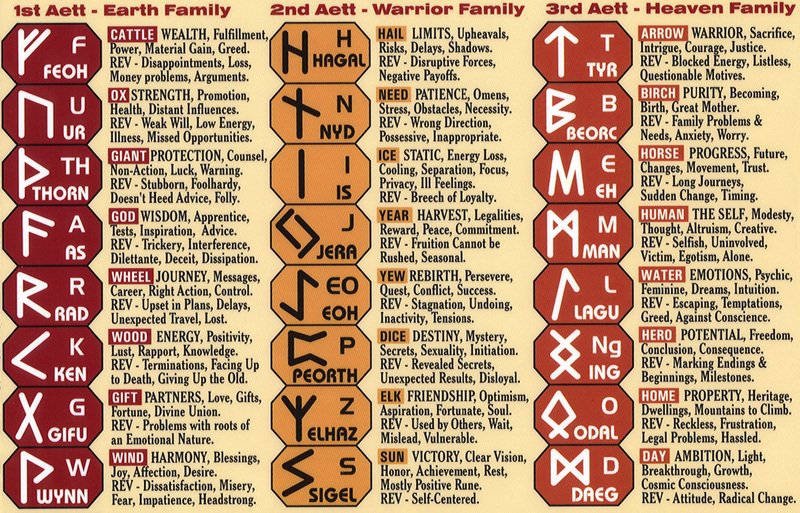 The runes are broken into three groups of eight, called aett (aettir), meaning ’family’. The First Aett is also known as Freyja’s Aett, the Second as Heimdall’s Aett, the Third as Tyr’s Aett. In Norse mythology, it is thought that Odin hung upside down from a tree for nine days, after which he learned the secret of the runes and became their master (translated from the poem Havamal in the Poetic Edda). Since each letter has a specific meaning, runes are also used in divination and magick. Cunningham says that “runes are symbols that, when drawn, painted, traced, carved or visualized, release specific energies”. Runes are commonly drawn or carved on wood, clay, stone or other natural objects. Modern day rune sets are made out of 24 letters, 25 if you include the blank or Wyrd rune, which symbolizes fate or the unknown. Yes, it refers to ‘reverse’. If the rune (just like Tarot cards) are drawn reversed, that often changes the meaning. Sorry for the confusion!